Read the following quotations about the day of the Lord. that He did to describe the overthrow of a nation. they were one of the mightiest nations to ever exist outside of God’s kingdom. kingdom of bronze, which shall rule over all the earth…” (Daniel 2:37-39, emp. from the Almighty” (Isaiah 13:4-6, emp. added). shine” (Isa 13:8-10, emp. added). earth will move out of her place, In the wrath of the LORD of hosts And in the day of His fierce anger” (Isaiah 13:13, emp. added). the Chaldeans’ pride, Will be as when God overthrew Sodom and Gomorrah” (Isaiah 13:17-19, emp. added). called “apocalyptic language” (which is not to be taken as woodenly literal). concerning the fall of Ancient Babylon. heart of Egypt will melt in its midst” (Isaiah 19:1). they shall know that I am the LORD.’ “ (Ezekiel 30:26). them and fulfilled that judgement through a nation that He chose? His divine judgement upon a nation. the context in which they were in. 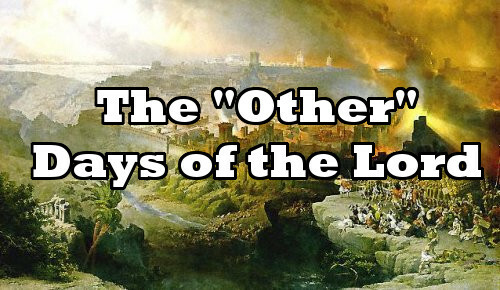 the Lord at the overthrow of Judaism in AD70. martyrs in AD70. However, the way in which the language was used is the same. to what Jesus and the apostles said? They would expect God to use language consistently. figuratively, and still be truthful, why couldn’t Jesus do the same? which He was living?” I believe it! Do you? Christ at the fall of Jerusalem in AD70.